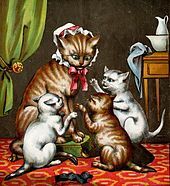 Three Little Kittens is an English language nursery rhyme, probably with roots in the British folk tradition. The poem is usually attributed to American poet Eliza Lee Cabot Follen. The poem was first printed in 1833 in Britain in Follen's Little Songs for Little Boys and Girls. 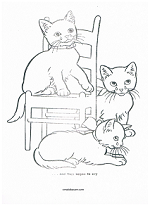 The rhyme is a simple story of three kittens who lose their mittens and are told they will not get pie. 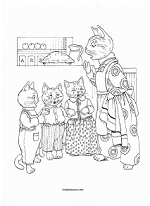 They, then, find their mittens... and are rewarded with pie. 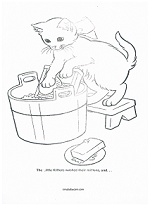 Unfortunately, eating pie soils the mittens and the kittens have to wash them. I used this rhyme to teach children that there are consequences for their actions. Sometimes the consequences are good and sometimes not so good. There are several verses to this rhyme. Typically kids are taught the first verse only, but all verses are included here in case you wish to share. 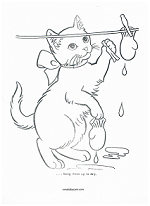 Then, scroll to the bottom to find coloring sheets to accompany this rhyme.